The GLX Strength Training System is a well known Home Gym and is very suitable for Traditional Strength Training, Functional Training, Core Training, Sports Specific and Rehabilitation exercises. BodyCraft does not compromises in its quality and has a space saver design. Cable Station- Allows for a very wide array of exercises including Functional Training, Sports Specific, Core Training, and exercises that mimic Dumbbell Training. Adjustable Nylon Straps– Provide for converging and free motion exercises. Space saving design- Allows placement against a wall. Ab Crunch Station– For abdominal training. Low Pulley Station- Foot plate for Low Rows, Abductor and Adductor Leg Kicks, Arm Curls, Upright rows, etc. 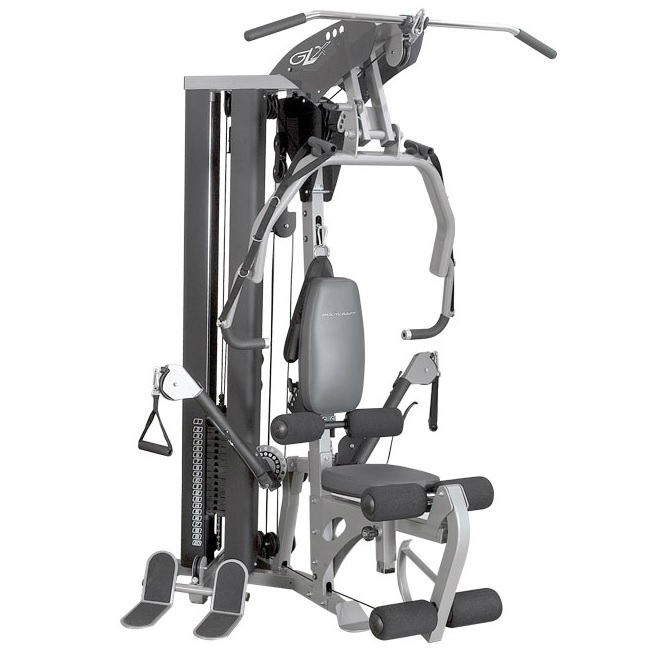 Press and Row Station- Allows for different size users and also provides a variety of exercises including Bench Press, Incline Press, Shoulder Press and Mid Row. Seat and seat back are adjustable. Back pad tilts to ensure full support when performing incline and shoulder presses. Optional Leg Press attachment- For full leg development. *Note: Most of the sites, stores or shopping portals listed above sell GLX Strength Training System with discounts and other exciting offers. There is a possibility that the some of above websites are not selling GLX Strength Training System now. Toughtrain.com is not liable for such cases or instances. Also we do not recommend any seller for GLX Strength Training System and a buyer should buy from where he/she gets best deal with quality of products, service and on time delivery (shipment).